The book Broken Pieces has just been released and, when Westminster Seminary Bookstore had a good sale on it online, I purchased it for the seminary library, believing it would be of use for pastors and counselors who deal with various types of mental illness including schizophrenia. Little did I know the book’s value and power. I did recognize the importance of the subject, and I did note the author – Simonetta Carr, a Reformed wife , mother, and author of several children’s books for the series “Christian Biographies for Young Readers.” But I had no idea of her intense, personal struggle with this mental illness in her son. And I am thankful for the fine way in which pastor William Boekestein has called attention to her story of grief and grace in this brief review posted on Reformation21 website recently. I quote a portion of it for you here. And for those who can identify with this aspect of our brokenness, you will find help and hope. Broken Pieces is one of the most courageous books I have ever read. Simonetta told me, “It hurt me to write it because I was reliving every moment.” I couldn’t have written it. I would have been too scared. But I am so glad Simonetta did. And perhaps now I am a little more ready to follow her lead in sharing some of my grief with other receivers. One of my wife’s grandmothers had schizophrenia. During the last years of her life she broke off communication with us because we told her how much we loved her house; she thought we were trying to take it. We saw her only one time in the months before her death. She told us not to come. But we showed up at her front door, unannounced, with our charming two-year-old extended toward the door; a peace-offering no grandma could resist. She buckled, and let us in one last time. Schizophrenia made grandma unpredictable. The family genuinely feared that she would leave her entire estate to her dog. More seriously, her children grew up in a home with their mother institutionalized for long stretches. I wish Eva’s husband, children, and grandchildren had been able to read Broken Pieces. I’m glad I have now. It was a painful crash-course in sympathetic, and persistent love; lessons I know I need to learn for trials that I cannot foresee. More than that, it is a portrait of living faith in a Savior whose grace is tailor-made for this broken world. Broken Pieces is also surprisingly hopeful. Simonetta didn’t gauge the eternal destiny of her schizophrenic son by placing everything she knew about him on two sides of a scale; one side positive, and the other negative. The tangibly negative experiences would have been too heavy. Instead, she saw her son as entirely in Christ; in life and in death, in body and soul, in clarity and confusion. And Jesus was more than enough to rescue a man who was so deeply broken. Our family saw that too. Grandma’s schizophrenia scared us and her. But God also helped us to hope. After I read her Isaiah 53–being Jewish, this is a text from the “Bible” she was raised with–she responded: “That’s talking about Jesus. I believe in him!” We didn’t expect that response. But why not? We possess a shared history of God’s redemption of desperately lost people. We have received God’s record of mending, the backstory we all need as we share each other’s burdens. Since this original post, I also received notice of an interview that “Redeemed Reader” did with the author. Find that at this link. A little while ago while sorting through today’s emails, I learned it is National Adoption Day. It was Crossway publishers who pointed me to that fact, in an email highlighting some new articles published on it’s website. Perhaps, like me (ordinarily), you might be tempted to pass over a highlighted article on adoption, and just delete the email and move on to the next. But if you have an adopted child in your immediate family (as we do), you stop and pay attention. Because you realize how significant one adoption is. And how special one adopted grandson is. The same is true if there is an adoption in your broader family (as there is in ours and will be soon again), in your church family (as there is in ours at Faith PRC), and among your friends (as we too have). And when you hear the testimony of an adopted son about his Christian father and the influence he had on this son throughout his life (as we heard from a dear cousin last night at a very special family reunion), then you realize the power and blessedness of earthly adoption by Christian couples and families. A gift from God our Father to His children. A means of grace. Yes, in the life of one lost soul. Multiplied thousands of times, one soul at a time, from all over the world, including nearby neighborhoods. Taken in by love, surrounded by love, raised in love, and pointed to true love. God’s, in Jesus. So that that adopted child comes to know and embrace and confess that divine love. And rejoices (glories!) in what God has done. For him! For her! And believing parents and siblings cry with joy, and treasure God’s work. And then you better understand the picture of a higher, greater, deeper reality – what the Sovereign of salvation has done for you (for me! ), another lost orphan in this cruel world of sin and darkness. You see, you and I were abandoned by the Prince of this world (a pretentious but pernicious father!) who promised us everything but left us nothing – destitute, deserted – in reality, dead. But that Father on the heavenly throne looked on you and me with the eyes of love (because His heart was so full of it for you! ), took us up His arms and placed us in His only-begotten, beloved Son, through Whom He bought us and took us home (O, what a family He has!). And then He took the Spirit of His Son and sent Him to change us from dead sinners into living children of the Father, from utterly destitute into the richest sons and daughters in the world, and in the world to come. Deserted no more, we have fellowship with the Father, in the Son, through the Spirit, and belong to the biggest and best family in the world (the church of Jesus Christ)! It is the grandest adoption of all! If you doubt it, read Ephesians 1-3 again. And fall to the ground in praise of that glorious grace. And then think about what that earthly picture can mean in a Christian family and church family. And ponder its implications for us. Russell Moore has some things for us to think about in that Crossway article for National Adoption Day. Yes, he may write from a theological perspective different from our Reformed, covenantal perspective. But he writes as a Christian man and as a saved-by-grace sinner who knows what earthly adoption means because of his heavenly one. So, listen and learn from what he says. He don’t have to agree with everything. Just take the heart of it. Because that comes from the heart of our Father above. Here is part of what Moore writes; find the rest at the link below. The gospel of Jesus Christ means our families and churches ought to be at the forefront of the adoption of orphans close to home and around the world. As we become more attuned to the gospel, we’ll have more of a burden for orphans. As we become more adoption friendly, we’ll be better able to understand the gospel. We are being called to look forward to an adoptive missional church. I want to call us all to consider how encouraging adoption—whether we adopt or whether we help others adopt—can help us peer into the ancient mystery of our faith in Christ and can help us restore the fracturing unity and the atrophied mission of our congregations. It is one thing when the culture doesn’t “get” adoption. What else could one expect when all of life is seen as the quest of “selfish genes” for survival? It is one thing when the culture doesn’t “get” adoption and so speaks of buying a cat as “adopting” a pet. But when those who follow Christ think the same way, we betray that we miss something crucial about our own salvation. Adoption is not just about couples who want children—or who want more children. Adoption is about an entire culture within our churches, a culture that sees adoption as part of our Great Commission mandate and as a sign of the gospel itself. A Tribute to Our Sacrificing Mothers: The Altar of Motherhood – W. Wangerin, Jr.
Ah, Mother, every summer since then I have thought of you and all of your sisters through the ages. I see you, darling, distinctly – as in a vision. I see deep, and I see this: that once there lay in the precinct of many mothers’ souls some precious personal thing. Some talent, some private dream. The characteristic by which they defined their selves and their purpose for being. To write? Maybe. To run a marathon? Or to run a company? Yes. Yes. But then the baby came home, and then you and others like you made a terrible, terribly lovely choice. You reached into your soul and withdrew that precious thing and lifted it up before your breast and began to walk. Deliberate and utterly beautiful, you strode to the altar of love for this child and placed there the talent, the dream, some core part of your particular self – and in order to mother another, you released it. There came for you a moment of conscious, sacred sacrifice. In that moment the self of yourself became a smoke, and the smoke went up to heaven as a perpetual prayer for the sake of your children. And when it was voluntary, it was no less than divine. Never, never let anyone force such a gift from any woman! – for then it is not sacrifice at all. It is oppression. But never, either, dear children, take such an extraordinary love for granted. It is holy. For this, in the face of such women, is the mind of Christ, who emptied himself for us. And then again, for us. Ah, Mother, I am so slow to know, but now I know – and out of the knowledge wherewith my own children have burdened me I thank you. From an overflowing heart, I thank you, Mother, for your motherhood. Taken from chapter 17, “The Altar of Motherhood,” of Walter Wangerin Jr.’s Little Lamb, Who Made Thee? A Book about Children and Parents (Zondervan, 1993; reprinted in 2004). This comes at the end of the author’s story of his struggle to care for the household after he and his wife reversed roles for a time (including a summer when he about went crazy!). He had begun his writing career and she returned temporarily to working full time to help support the family. They both found out this could not last, prompting him to praise his own mother and his wife for their sacrificial labor in the home. Which brings to mind my own dear mother and my own dear wife and the sacrifices they made for me and my siblings and for our children, respectively. From “an overflowing heart” I also thank you, precious mothers for your motherhood. “They took their Baby B to the steadfast arms of the Father so that whatever happened, the love of God would hold it.” ~ W. Wangerin, Jr. I mentioned last week that one of the books I took along on vacation for continued reading was Little Lamb, Who Made Thee? A Book about Children and Parents by Walter Wangerin, Jr. (Zondervan, 1993; reprinted in 2004). While reading a couple more sections, I came on some great quotes. I shared one last week; tonight I give you another. This one is from Part II of the book, where the author relates the raising of his own family while serving as a Lutheran pastor. In one of his churches Wangerin served as the godfather of a boy whom he calls “Baby B” (for Brandon – the chapter title is “I Love Thee, Baby B”). The boy became ill and crippled due to a tumor near his thighbone. While the parents and congregation were anxiously waiting for the biopsy and then the surgery, they joined in prayer together for the child. Especially the parents. You have bold parents, B. They are patient and faithful. Their patience may – as with silly physicians and sillier children – come sometimes to an end. But never their faith. We all prayed for you, then, Brandon Michael Piper. You won’t remember. But the aunts and the uncles, your parents and grandparents and godparents and the whole congregation of Grace commended to heaven both your big name and your little leg. It is at this point that Wangerin has some marvelous thoughts on the nature of prayer for a sick child – thoughts that are applicable to all our trials. You see, Brandon, this was their faith: not that they felt God had to heal you on account of prayer, but rather that they wanted never to stand apart from God, especially not now. Yes, they were scared for you. But they were never, never scared of God, nor ever scared to lose God. They took their Baby B to the steadfast arms of the Father so that whatever happened, the love of God would hold it. Might there be a healing? Then give glory to God. Must there be a worse hurt? Then let the dear Lord strengthen everyone when strength would be most needed. Their prayer was meant neither as a demand nor as magic, neither an ultimatum nor manipulation of the Deity. It was love. It was their highest expression of faith – not faith in your healing, Brandon (though they yearned that) but faith in God. “…Struck dumb by the impossible beauty” of God’s grace – W. Wangerin, Jr.
One of the books I took along on vacation last week to continue reading was Little Lamb, Who Made Thee? A Book about Children and Parents by Walter Wangerin, Jr. (Zondervan, 1993; reprinted in 2004. Mine is a first ed., hardcover). As I have mentioned here before, Wangerin is one of my favorite Christian (Lutheran) authors. He has a way with words – sometimes humorous but always serious – as well as keen insights into the historic Christian faith and life. I came across some gems last week and decided to share a few of them here with you. The first is taken from a chapter with the title “How Precious Did That Grace Appear,” which you may recognize as taken from the hymn “Amazing Grace.” As Wangerin describes his Lutheran confirmation ceremony (similar to our profession of faith), which involved answering questions about the Christian faith in front of the congregation (based on the Bible and the catechism of Luther), he relates the wonder of the truth of God’s saving grace – a blessed reality he came to experience more fully as he matured. I was a smart kid. And yet I did not really know what I was talking about. I had just accomplished this most difficult task. I did it. Therefore, although I could speak well and wisely of grace, that was in itself the problem which condemned me: I could speak of grace, even glibly and casually. I was not struck dumb by the impossible beauty of the thing. I was not overwhelmed by the absolute absurdity, the flat illogic, the utter conundrum of this act of God. In fact, by every moral and human right, grace cannot be. And without it, we die. One ought to lay one’s hand upon one’s mouth in the presence of such a thaumaturge [that’s a great Greek-origin word to look up!] and answer nothing. One ought to confess that he has spoken without knowledge, that he has uttered things too wonderful for him, and so repent in dust and ashes. But I was self-important in those days. I had not actually experienced love when I knew I didn’t deserve it. Doctrine may teach us the definitions of our faith’s most fundamental truths; but the truths themselves elude us until we meet them ourselves and experience them: meet them, greet them, and find ourselves to be borne aloft by them. Then we know what hitherto we’d only learned by rote. Wangerin is a faithful Christian husband and father and I highly recommend this book about his own godly rearing as a child and then his experience as a parent raising his own children. You will laugh and you will cry, but most of all you will grow in the knowledge and experience of that “precious grace” of our perfect Father. I have another gem for you – this time about praying for a sick child. Marvelous! The New York Times recently posted this article online and it was picked up by some of the book and reading news sources I receive, which immediately caught my attention. 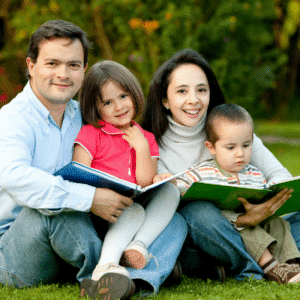 While it is not anything new, it confirms once more what other studies have proved – that reading to children at an early age is a tremendous benefit to their psychological, emotional, and educational development. And we would add, of course, that when God’s Word and other good Christian literature are read to them, their spiritual development is enhanced. This “truism” is worth remembering in our own homes as well. I hope we are exposing our children to good literature at an early age and giving them the thrill of seeing and hearing words and experiences expressed in the world of books. The benefits are well documented. Gift Ideas for the Entire Family – The BIG List! When it comes to buying a gift for someone you love, a book is a good choice! Sharing a book you love is like sharing a little bit of your heart with someone else. And who doesn’t love help completing their personal library? With these things in mind, we’ve put together some of our favorite volumes to help you take the guess work out of buying a book as a gift. I will not produce the whole list here, but I will give you the first part, which is a great list of titles for the whole reading family. The Rhyme and Reason Series – Author Catherine Zoller knows how to reach children with the message of the Bible! She understands the importance of reading aloud to children and filling their lives with the Word of God. Her Rhyme and Reason series does this very thing with beautiful and entertaining colorful illustrations as she retells the stories of books of the Bible, in rhyme! The Pilgrim’s Progress– The cloth cover is a beautiful work of art. Inside, the volume contains 171 well-crafted illustrations from an original 1891 edition. Share with your family the greatest allegory of the Christian life ever written. The Holy War The story: Righteous and honorable King Shaddai and His Son Immanuel are the kind rulers the city of Mansoul, always directing the lives of the city with justice and equity. But the ruler of darkness – Prince Diabolus – has his own plans for the city. With the assistance of his evil captains, he plots the destruction of the once happy town. The first to fall to his deceptions is Captain Resistance, so that Mansoul is now open to Diabolus’ wicked lies about their king. Diabolus knows that he may only possess Mansoul if the people open the gates to him by their own choice; and soon, sadly, through the vantage point of Eargate, the inhabitants believe his lies and the city falls. So begins this story of treachery and deceit, foolishness and pride, but forgiveness and final redemption. The fact is, as Bunyan intended it, this is the story of a sinner saved by the grace of God. Dangerous Journey– One of our best pictorial “gift” books for children 6 to 12 years of age. Beautifully illustrated with full color, artistic drawings on every page, most of them full page or even double-page spreads! The plot is faithfully preserved but the artwork makes this book a rare and special piece of work in itself, very detailed and full of action. This beautiful volume has long been a favorite, first introductory version of The Pilgrim’s Progress for parents to familiarize their young children with the story. A Theology of the Family – This book presents a perspective on the family largely forgotten by the modern church. There are 56 authors featured in this volume, among whom are: John Bunyan, Jonathan Edwards, John Gill, William Gouge, Matthew Henry, Martin Luther, A.W. Pink, J. C. Ryle, R. C. Sproul, Charles Spurgeon and Thomas Watson. Each of them give a powerful testimony that the 21st century church needs to be reminded of what she used to believe about family life. These authors bring a measure of the correction and the balm necessary to heal our amnesia and return us to biblical order. Building on the Rock Series– Full set of all 5 devotional books in the Building on the Rock series. Each contains a true story from history which is used to illustrate truths of Scripture. For children 8-12 to read, and makes great read-alouds for ages 4-7. The Baker Family Adventures– Meet Mr. and Mrs. Baker and their four children: responsible Phil, sensible Abby, daring Andy, and inquisitive Tom. The Bakers are a Christian homeschooling family who love helping others, and they seem to have a knack for finding people who need help. In the seven (7) volumes of the Baker Family Adventures Series by C. R. Hedgcock. Reformation ABCs – This informative book by historian Stephen J. Nichols offers kids of ages three to six an engaging way to learn about that pivotal era in church history – while they learn their ABCs! Featuring charming illustrations by Ned Bustard, this book introduces families to a host of important figures, locations, concepts, and events, including John Calvin, justification by faith alone, Heidelberg, Westminster, and more. Families will be able to see God’s hand in the Reformation and how he used it to shape his people’s understanding of his Word. Jack and Jenny Series – Full of adventure, suspense, and all while learning Biblical truth and applying the Word of God to daily life, the Jack and Jenny Mysteries are a new and exciting set of six (6) volumes for readers 8-12 years of age. Greatly reduced to a bargain price when bought as a set! The Knight’s Map– In this allegorical tale, theologian, pastor, and author Dr. R.C. Sproul continues his life’s work of making deep biblical truths clear and understandable to children of all ages. The Knight’s Map is the story of a knight who undertakes a perilous journey, but his course is full of people who give him bad advice and send him on wrong turns. In the end, he must decide whether or not he will trust the map provided by the King. Beautiful, full color illustrations by Richard Lawnes reveal this rich, textured world and discussion questions with Scripture references help parents guide their children into the deeper meaning of the story. The Priest With Dirty Clothes – In this new edition of his classic story, The Priest with Dirty Clothes, Dr. R.C. Sproul continues his project of illustrating theological concepts for children. In this book, he teaches the concept of imputation, which lies at the heart of the important biblical doctrine of justification.Using the story of Joshua the high priest (Zechariah 3:1–5) as his jumping-off point, Dr. Sproul weaves a classic tale about a young priest who is invited to preach his first sermon before the king and his court. But on his way to the palace, he falls from his horse, getting his clothes hopelessly muddy. Jonathan finds that he needs powerful help if he is to stand before the king. This edition of The Priest with Dirty Clothes includes all-new illustrations by Justin Gerard. Also includes a new “For the Parents” section to help them bring out the truths of the book for their children. The Ology: Ancient Truths Ever New – A Page-Turning Storybook of Theology for Kids In the cellar of the old stone cathedral, Carla and Timothy uncover a life-changing treasure, a carefully wrapped ancient book known as The Ology. What adults might describe as a beautifully illustrated storybook of systematic theology, the kids discover to be a story of adventure, mystery, and wonder that leads them to the truth about God, themselves, and the world around them. Truth is for kids, not just for adults! So The Ology gives kids of all ages a beginner’s theology book to help them understand who God is and how we, as his children, relate to him. Arranged within a traditional systematic theological framework, each truth in The Ology is also connected to the larger redemptive story of Scripture. The doctrine of God, for example, is presented in the larger framework of creation, where the attributes of God are on display and easier to understand. Designed for six-year-olds through preteens, this flexible resource includes built-in adaptations for use with younger or older children, so that entire families can enjoy it together. Christian Biographies for Young Readers (Simonetta Carr) – The Christian Biographies for Young Readers introduces children to important people in the Christian tradition. Parents and school teachers alike will welcome the excellent educational value it provides for students, while the quality of the publication and the artwork make each volume a keepsake for generations to come. Furthermore, the books in the series go beyond the simple story of someone’s life by teaching young readers the historical and theological relevance of each character. Kingdom Tales (David & Karen Mains)Like the Terrestria Chronicles, each Kingdom Tales from Terrestria book was written to honor and glorify the Lord Jesus Christ as King and challenge the reader to love and serve Him. The stories are fast-paced and captivating, but each was written to deliver a powerful message and draw your heart to the King. Unlike the Chronicles, which are sequential and should be read chronologically, the Tales are stand-alone books and can be read in almost any order. Books 2 and 3 belong together, and Books 4 and 5 should be read together. It is our prayer that the Kingdom Tales from Terrestria will challenge your entire family to serve the King of kings. The Jungle Doctor Series-Paul White was an Australian missionary doctor in Africa early in the 20th century, who gained great skill at teaching the Bible through creative stories based on his missions work. These tales have a timeless quality which has captivated readers for three generations now. When Dr. White returned home to Australia, his stories were discovered and published with an enthusiastic, world-wide reception. Children of all ages delight in the Jungle Doctor series, which are written for readers about ages 9-13, but adults love their creative stories, and they make superb read-aloud stories to children from 5-8, who will have no difficulty understanding them! The full collection is 19 volumes and we have compiled them into three collections for easy purchase: Volumes 1-6 as an introductory set. Volumes 7-12 for more. And Volumes 13-19 to complete your entire collection! The Jungle Doctor series are exceptional for family reading. Great Composers Series: Complete set of 16 books! (Opal Wheeler)- For the first time in decades, a treasure is back in print: the complete set of all 16 Opal Wheeler volumes on The Great Composers — and now offered as a set for a terrific sale price! Each volume is an enlarged, lay-open, beautifully illustrated paperback. Each book also contains a skillful biography of the composer, which young people from 4-15 will enjoy. Illustrations are found on almost every page, and many of the compositions of the composer. The list includes sections for your pastor, your boys, your girls, your wife, and your husband. I did not find the list on their website, but if you sign up for their newsletter, I am sure you can request this email newsletter. In any case, it will be for your profit to be on their email list. As you have noticed, I have been absent from these “pages” for a week. That was due to circumstances surrounding care for our ailing mother, whom God delivered out of this vale of tears and shadow of death and ushered into everlasting glory this past Monday morning. A private family funeral and committal service was held yesterday morning and a public memorial service last evening, both in dad and mom’s home church, Hope PRC in Grand Rapids, MI. Watching one’s mother die is one of the hardest experiences in life but, when she is in the Lord and has the hope of the gospel of Jesus Christ in her heart, it is one of the most precious experiences in life. We praise God for His mercy to our dear mother, and for His sustaining, comforting grace to us as a family. Today’s “Grace Gems” devotional was timely and comforting, as this is the way mom always taught us to live – one day at a time, without fear or worry for the next. I pray it comforts your heart as it did mine, whatever your circumstance may be today. One of the secrets of happy and beautiful life, is to live one day at a time. Really, we never have anything to do any day–but the bit of God’s will for that day. If we do that well–we have absolutely nothing else to do. Time is given to us in days. It was so from the beginning. This breaking up of time into little daily portions means a great deal more than we are accustomed to think. For one thing, it illustrates the gentleness and goodness of God. It would have made life intolerably burdensome if a year, instead of a day–had been the unit of division. It would have been hard to carry a heavy load, to endure a great sorrow, or to keep on at a hard duty–for such a long stretch of time. How dreary our common task-work would be–if there were no breaks in it, if we had to keep our hand to the plough for a whole year! We never could go on with our struggles, our battles, our suffering–if night did not mercifully settle down with its darkness, and bid us rest and renew our strength. We do not understand how great a mercy there is for us in the briefness of our short days. If they were even twice as long as they are–life would be intolerable! Many a time when the sun goes down–we feel that we could scarcely have gone another step. We would have fainted in defeat–if the summons to rest had not come just when it did. We see the graciousness of the divine thoughtfulness in giving us time in periods of little days, which we can easily get through with–and not in great years, in which we would faint and fall by the way. It makes it possible for us to go on through all the long years and not to be overwrought, for we never have given to us at any one time–more than we can do between the morning and the evening. To guide my footsteps in His holy way. In joy and sorrow, working, playing, giving. Could be a light upon my pathway ever. And told me of the love that naught can sever. Turn from the wrong and follow where He leads. A source of strength – a life to emulate. Who taught me reverence for His name so great. A Mother’s Day poem written by Mrs. Thelma Westra, a fellow church member at Faith PRC. They may be found in her collection of Christian poetry titled Poems of Praise (self-published), p.44. Today may we rise up and call our godly mothers blessed, even as we bless the God who gave them to us (Prov.31:28). I am thankful for my own godly mother, for the godly mother of our children (my wife), and for her godly mother. You are truly beautiful women and your price is “far above rubies” (v.10). May you hear God’s honor and praise through us and your children today. For another encouraging word to godly mothers and women in Israel, read Rev. Josh Engelsma’s post on the RFPA blog yesterday. Here’s the first part of it; find the rest at the link above.